Dina 2's Story . . .
Update 11/10/2015: "Remember: good things come in small packages. Can't you just picture little Dina, big bow around her collar, as your most treasured holiday gift?" Dina’s ear seems to be all cleared up, which is good news…no more howling from getting those dreaded ear drops inserted! She is a little sad, however, that her good buddy, Star, was adopted. On the other hand, she’s very happy that her spot on the bed is now much bigger and closer to Dad! After eating, Dina has a tendency to get a little gas build-up. Her dad has begun giving her a small amount of an over-the-counter anti-gas supplement, which helps make her feel much more comfortable. Dina’s been told that if she’s still at her foster home for Christmas, she will be receiving a special present ...a weeklong visit from her good friend, Star. While that would be a joyous reunion, this happy girl still dreams of the day when she will find her forever home. She’s certainly hoping to be “Home for the Holidays” with that special person to call her own. Remember: good things come in small packages. Can’t you just picture little Dina, big bow around her collar, as your most treasured holiday gift? Dina continues to be such a good girl. Her foster dad has noticed she’s put on a bit of weight, but who can blame a girl for loving her mealtime! Along with her companion, Star, Dina recently had paw hair and nails trimmed. Although she did fine, she did not enjoy this experience. She is, however, enjoying how much easier it is to walk on the hardwood floors. Dina’s sneezing episodes have stopped, so logic says she was suffering from some summer-related allergies. She has a slight ear infection and the howls she makes when her ears are getting cleaned are comical and VERY loud... :). If all goes as planned, Dina and Star might make an appearance at the upcoming Springerfest in Pasadena, Maryland…paws crossed! Update 08/21/2015: "I am the #1 favorite dog of everyone that comes to visit and I have to say #2 is not even close... :))." … and currently hanging out at my foster house with 8 other dogs. As you may have read, I am around 11 years old and I have been told I am a Beagle and not a Springer. I have lived with Springers my whole life, so I feel like I can call myself one! Like my best friend, Star, I don’t mind sharing the house and my foster dad with all the other dogs. However, I would love to have a few less dogs to compete with for snuggle time. Star and I get so excited at feeding time that we dance all over the kitchen while dinner is being prepared. My foster dad knows enough to feed us first since we just get so excited. While my sister is quiet as a church mouse, I on occasion have been known to bark a bit. Some days I will just walk the fence line quietly and other days I will bark to let people know I see them. I have almost perfect house manners and will do my best to make sure any treats or food that may hit the floor are cleaned up as quickly as possible. Any food left on a counter will be inspected and eaten if necessary. Three times a week a neighborhood girl takes me on a mile walk to help keep me in shape and I really enjoy the exercise. Since I am small and walk well on a leash, it is a fun experience for all involved. I take some daily pills to help keep me pain-free and sometimes I have reverse sneezing episodes, but that is a small price to pay for such a sweet girl. I am the #1 favorite dog of everyone that comes to visit and I have to say #2 is not even close... :)). This undisputed fact, along with my wry sense of humor, should turn heads my way. Please ask about meeting me soon; I’m absolutely delightful in person!!!! In the past month, Dina has filled out her small frame (adding five pounds!) and blew her coat. Now that she’s jettisoned that old fur she feels so much softer than when she came into rescue. Daily medications for her joint health have helped so much. Dina’s a happy little girl that loves to roam in her backyard. One of her favorite activities is eating the boysenberries that fall to the ground. Ahhh…summertime fruit! 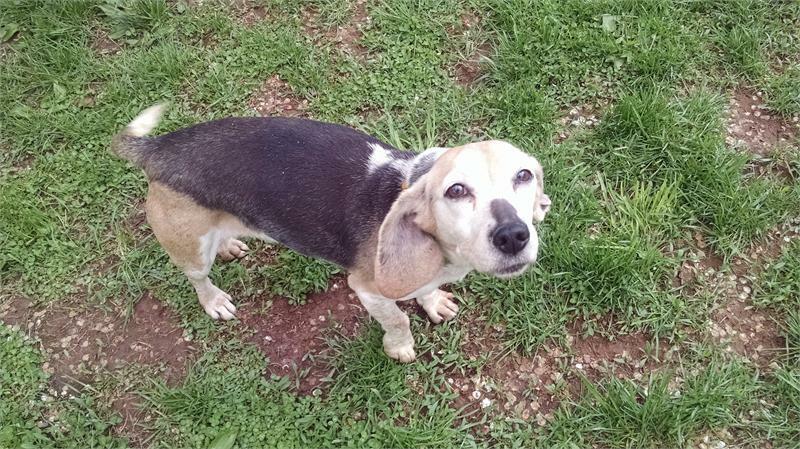 If she’s outside with the other dogs when someone walks by, she will join in the chorus using her Beagle bark. If she’s alone, however, she will merely walk along the fence hoping she’ll receive a quick pet from a friendly soul. If she’s indoors, Dina loves to jog through the house looking for any action that she can get into. She’s a real foodie and will use her climbing skills to determine if anything edible has been left out. Must be careful with this wily gal! Dina’s a sweet, happy pup that is still looking for her forever home. If you’ve been searching for a wonderful companion in a small package, this honorary Springer’s your girl. Summertime, summertime, summertime!!! 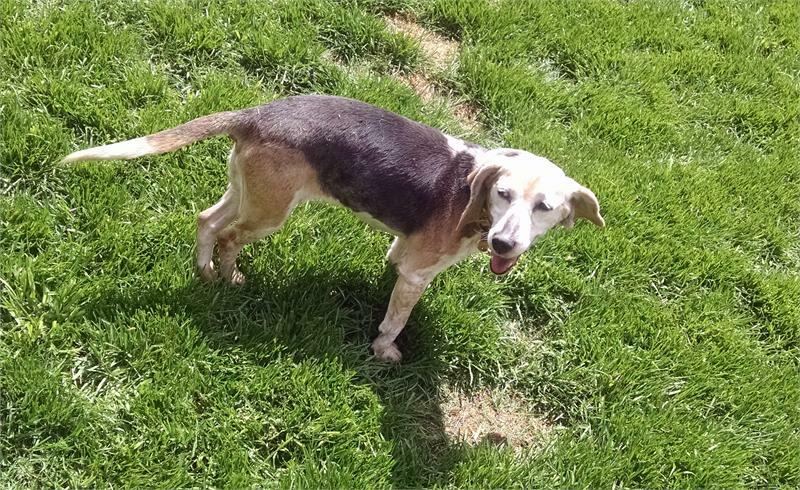 And MAESSR’s beagle, Dina, is enjoying the time she spends sunning herself in her foster home’s backyard. What a life she has surrounded by 2- and 4-legged friends! Should anyone be wondering whether Dina is benefiting from the medicine she receives to alleviate her hind quarter stiffness, her foster dad reports she is now climbing the counters like a cat burglar. After only one time of her eating four hot dog rolls, her family realized the counters need to be clear of any food. Isn’t she a good people trainer? Dina also now has the ability to jump on the couches and the bed; she makes sure she gets a good spot for herself at bed time. A girl’s gotta do what a girl’s gotta do. After all, cuddling is one of the most important things in life! Dina is not a Springer, but she probably thinks she is!! She is as sweet as can be, gets along with everyone, and just loves life. She will be a wonderful addition to someone’s home…and this former hunting lass will help keep the backyard free of critters! Due to changes in her Pennsylvania owner’s life, Dina and her three Springer siblings needed to find a new home. When her owner had no luck finding accommodations for Dina, who happens to be a Beagle, MAESSR agreed to make this petite pup an honorary Springer! It appears that Dina was well taken care of during her former life and she is in pretty good shape for a lady of her age. A visit to the vet detected a slight stiffness in her back legs and hips; it’s possible that this is the result of a past back injury. She is beginning to take some medications to see they are beneficial. Keeping her current weight will be important for Dina’s future joint health. In her former home Dina was used for hunting birds and she just loves to roam the backyard of her foster home while keeping her nose to the ground. It is recommended that her new family have a fully fenced backyard for this bird dog! Now living with seven other dogs, Dina has settled into a routine and seems to be doing well. She has been around children as young as five years old and is great with them. Her tail always seems to be wagging! Dina’s also great with the other dogs; it’s unknown how she would react to cats. In her foster home, Dina eats her food next to her sister, Star. She does not guard her food, but she is very food motivated and will try to steal the other dogs’ treats. This will have to stop if she’s to keep her girlish figure! 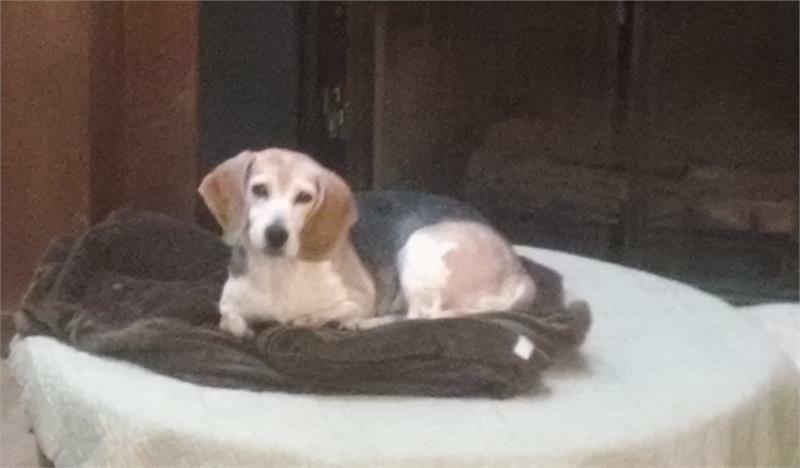 Completely housetrained, Dina has free run of the house when no one is home and does not need to be crated. Her foster dad has seen her snoozing away on one of the dog beds when he returns. At night Dina might jump up on the couch, but usually ends up sleeping on a dog bed on the floor. Dina enjoys riding in the car, preferring to be up front in the passenger seat to catch all of the action. This sweet little Springer-wannabe is just looking for a family to help her enjoy her senior years. She promises to give lots of love in return!